Great Danes Bible And The Great Dane is your definitive and proven Great Danes Guide and will be your trusted resource for life with this magnificent breed! Everything is covered: from Great Dane Puppies, Great Dane Dogs, Great Dane Training, Great Dane Breeders, Great Dane History, Great Dane Health, Great Dane Sizes (How Big Do They Really Get? ), Great Danes Mixes, Great Dane Breeders & How to Pick the Best (While Avoiding The Worst! ), Bringing Your Great Dane Home, Great Dane Adults and Life Stages, Great Danes Nutrition (What you MUST Know), Great Dane Temperament, and all the proven INSIDER tips You’ll need to have the very best experience with your Great Dane!The Great Dane is a legendary companion and extremely rewarding breed, which is also quite unique, as you will learn within. Everything is covered from Great Dane breed history, finding the best Great Dane for your particular household, Great Dane Puppies and how to pick the best (while avoiding those that aren't right for you)!Great Dane Prices- what can you expect to pay? Great Dane Care (are there any special concerns?) and keeping your Vizsla healthy for life, is all covered within. Great Dane color variations and what the secrets they may hold for your Dane's health, are revealed within.Importantly- Great Dane life stages are covered from Great Dane Adolescence, through to Great Dane Adulthood and how to maximize each stage along the way. How to care for your Great Dane in old age, and even how to slow down the process! Mark Manfield covers in detail Great Dane Vaccinations, Great Dane Size, Lifespan, and much, much more - this is unmissable insider info!Whether you are considering a Great Dane for the first time, or a seasoned Great Dane owner and lover, the tricks and tips within this guide will prove invaluable. 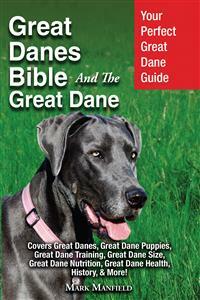 This book is the must-have guide for anyone passionate about the Great Dane! The book is written in an easy to read and understandable style. In a straight forward, no-nonsense fashion, Mark Manfield illuustrates vividly all aspects of your life with your Great Dane and the journey you're about to take together! "My Great Danes are truly gentle giants in my life and this guide has helped me ensure my dogs are extremely healthy and happy - thank you!" Rhonda Dusenbery, Charlotte, NC. "Great Dane Bible thank you - it's become my trusted Great Danes guide, the tips are really helpful and the photos are beautiful." Donna Stilton, Melbourne Australia“Great Danes Bible And The Great Dane is really a well thought out and comprehensive guide to the breed. I use it all the time for a reference and it's quite a fun read too." Chris Topaki, Minneapolis, MN. "Top Class Guide to Great Danes, you can't go wrong! "- James Silson, Phoenix, AZ. Published by DYM Worldwide Publishers 2018. Copyright and Trademarks. This publication is Copyright 2018 by DYM Worldwide Publishers. All products, publications, software, and services mentioned and recommended in this publication are protected by trademarks. In such instance, all trademarks & copyright belonging to the respective owners. All rights reserved. No part of this book may be reproduced or transferred in any form or by any means, graphic, electronic, or mechanical, including but not limited to photocopying, recording, taping, scanning, or by any information storage retrieval system, without the written permission of the author. Pictures used in this book are royalty free pictures purchased from stock photo websites with full rights for use within this work. Disclaimer and Legal Notice. This product is not legal or medical advice and should not be interpreted in that manner. You need to do your own due diligence to determine if the content of this product is right for you. The author, publisher, distributors, and or/affiliates of this product are not liable for any damages or losses associated with the content in this product. While every attempt has been made to verify the information shared in this publication, neither the author, publisher, distributors, and/or affiliates assume any responsibility for errors, omissions, or contrary interpretation of the subject matter herein. Any perceived slights to any specific person(s) or organization(s) are purely unintentional. We have no control over the nature, content, and availability of the websites listed in this book. The inclusion of any website links does not necessarily imply a recommendation or endorse the views expressed within them. DYM Worldwide Publishers takes no responsibility for, and will not be liable for, the websites being temporarily or being removed from the Internet. The accuracy and completeness of the information provided herein, and opinions stated herein are not guaranteed or warranted to produce any particular results, and the advice or strategies, contained herein may not be suitable for every individual. The author, publisher, distributors, and/or affiliates shall not be liable for any loss incurred as a consequence of the use and application, directly or indirectly of any information presented in this work. This publication is designed to provide information regarding the subject matter covered. The information included in this book has been compiled to give an overview of the topics covered. The information contained in this book has been compiled to provide an overview of the subject. It is not intended as medical advice and should not be construed as such. For a firm diagnosis of any medical conditions, you should consult a doctor or veterinarian (as related to animal health). The writer, publisher, distributors, and/or affiliates of this work are not responsible for any damages or negative consequences following any of the treatments or methods highlighted in this book. Website links are for informational purposes only and should not be seen as a personal endorsement; the same applies to any products or services mentioned in this work. The reader should also be aware that although the web links included were correct at the time of writing they may become out of date in the future. Any pricing or currency exchange rate information was accurate at the time of writing but may become out of date in the future. The Author, Publisher, distributors, and/or affiliates assume no responsibility for pricing and currency exchange rates mentioned within this work. What is the History and Background of The Great Dane? What Were Great Danes Bred For? European Great Dane and American Great Dane – What’s the Difference? Great Danes As Pets – Who Are They Suited For? What Does a Full Grown Great Dane Look Like? Great Dane Full Size – How Large Can They Get? Great Dane Average Weight – How Heavy Do They Get? What Is the Great Dane Temperament? What Do You Need to Know About Great Dane Behavior? Great Dane Life Expectancy – How Long Will the Great Dane Live with You? Great Dane Guard Dog – Is This the Right Breed for The Job? Great Dane Show Dogs – How Can You Maintain Them? Great Dane Hunting – Can This Breed Be Your Hunting Companion? Is the Great Dane The Best Dog for Your Family? Do the Great Dane And Children Get Along? Chapter 3 – Great Dane Supplies – What Do You Need? Great Dane Dog Food – What Is the Best Food for Great Danes And What Should You Consider When Buying It? Great Dane Puppy Food – What Should You Get for This Age? Great Dane Dog Beds – Which Are the Best Ones to Make Your Dog Comfortable? Great Dane Dog Collars– How Can You Find One That Fits Perfectly? Great Dane Leashes – What Are the Ideal Types and Lengths? Great Dane Harnesses – When Should You Use a Harness? Great Dane Dog Kennels – What Is the Best Size? Great Dane Crate – What Is the Best Size? Great Dane Trailers – What Is the Best Size? Great Dane Dog Shampoo – What Is the Best Type? Great Dane Brushes – Which Type to Choose? Great Dane Dog Houses – How Big Should They Be, and Which Features Should They Have? Great Dane Dog Toys – What Are Fun and Stimulating Items for Your Dog? Great Dane Puppy Toys – Which Are Appropriate? Great Dane Treats – Which Are Safe For Your Dog? Great Dane Muzzles – How Can You Find One That Fits Your Dog? Great Dane Saddles – Should You Let Your Dog Wear One? Chapter 4 – Great Dane Training – How Do You Get Started and Succeed? What Are the Things You Need for Great Dane Training? Great Dane Dog Treats – Which Are the Best Ones for Positive Reinforcement? How to Train a Great Dane – What Skills Must It Learn? Aggressive Great Danes – Are They a Concern? Can Great Danes Swim? How Can You Train Your Dog to Do So? Great Dane Shock Collar – Does Your Dog Need It for Training? Adult Great Dane Price – How Much Is? Great Dane Price Ranges – What Should You Expect? Buying a Great Dane – What Are the Things You Should Avoid? Great Dane Puppies – Where Should You Look for One? Buying A Great Dane Puppy – What Are the Questions to Ask? Chapter 6 – Great Dane Breeding – What Are the Important Things to Keep in Mind? Great Dane Breeders – What Are the Signs You Should Know of a Responsible One? Female Great Dane - How Can You Prepare Her for Breeding? Male Great Dane – How Can You Prepare Him for Breeding? Great Dane Stud – How Can You Take Care, And Look for One? New Born Pups – What to Feed a Great Dane Puppy? Chapter 7 – Great Dane Adoption – What Are the Crucial Things to Consider? Great Dane Rescue – What Happened to These Dogs? Great Dane Puppy Rescue – How to Take Care of a Rescued Dog? Great Danes For Adoption Near Me – Where Can I Find Them? Great Dane Rescue – How Can You Help? Great Dane Savvy Owner – How Can You Become One? Great Dane Puppies – How Can You Prepare Your Home for Them? Great Dane Dog Cages– Are They a Good Idea? Great Dane Kennels – Do You Need One for Your Dog? Great Dane Dog House – Where to Place It If You Get One? Great Dane Dog Beds – Where Are the Best Places to Put Them? Great Dane Dog Door – What Is the Ideal Size? Great Dane Dog Gates – Does Your House Need One? Should You Allow Your Dog to Lay on the Couch? Chapter 9 – Great Dane Health – What Should You Know? Great Dane Health Concerns – What Are the Common Problems for This Breed? Wobblers Great Dane – What Are the Symptoms? Great Dane Bloat – What Are the Signs Your Dog Is Experiencing This? Great Dane Vaccinations – Which Should Your Dog Get? Great Dane Vitamins – Which Should You Give Your Dog? Great Dane Weight – How Can You Keep It in a Healthy Range? Great Dane Growth Chart – How Can This Help You? Great Dane Diet and Nutrition – How Can You Maintain Your Dog’s Healthy Food Intake? Chapter 10 – Great Dane Care– How Can You Take Care of This Breed? Great Dane Care – What Do You Need to Know? Raising A Great Dane – Do You Have What It Takes? Great Dane Puppy Care – What Are the Important Things to Remember? Great Dane Running – Is This the Exercise It Needs? Great Dane Shedding – How Can You Manage It? Great Dane Grooming – What Should You Keep in Mind? Chapter 11 – Great Dane Mixes– What Are the Different Mixed Breeds That Exist? Miniature Great Danes – What Are Their Characteristics? Teacup Great Danes – Do They Exist? Long Haired Great Danes – Do They Exist? Great Dane Clubs – What Are the Criteria They Look For? Great Dane Competitions – What Are the Different Kinds and How You Can Enter Your Dog? Giant, tall, and massive … the Great Dane usually comes first to mind, when you think of a dog with these characteristics. They are one of the tallest and largest dog breeds in the world, and they always have a place in this category of world records. It is known as the “Apollo of Dogs” because of its sturdy but elegant stature. Despite its intimidating size, these dogs are calm and have a mild temperament. In fact, they are fondly known as gentle giants. Giant, tall, and massive … the Great Dane usually comes first to mind when you think of a dog with these characteristics. The American Kennel Club describes the Great Dane as having a combination of a “regal, dignified, strong, and elegant appearance. Its body is well-formed, smooth, and muscled. It doesn’t appear clumsy when it walks; the Great Dane’s gait is graceful, thanks to its proportionately long legs. Its neck is long and graceful, and on top of it is a massive head, which is long and narrow.” Their paws are massive and as big as a man’s hand! The Great Dane has been popularly known as a house companion, but you would be surprised to find out that it was originally bred to be a hunting and working dog. Many historical murals, as early as the 13th century, depict large boarhounds that look similar to the Great Dane. Around the 16th to the 17th century, they became companions to their noble owners who hunted bear, boar, and deer. It is a great family dog and is gentle and playful with children. Its hunting instincts have been bred out through generations, and they rarely show aggressive behavior. It is essential, however, to socialize the Great Dane while it is still young. Doing this early on will train it not to react to strangers and to new environments negatively. Even though it has a peaceful demeanor, it will not hesitate to keep its guard up and defend its pack. Despite its large build, the Great Dane is susceptible to a lot of health conditions. Surprisingly, they are one of the dog breeds that have the shortest lifespan. The average lifespan of the Great Dane is only 7 years, while other dogs can live up to 15 years. Among the health conditions, you need to watch out for is wobbler syndrome and bloat, which can be fatal for your Great Dane if not attended to immediately. Because of its size, you need to provide it with ample space to move around. This dog is not ideal for small living spaces, such as apartments, where it does not have much room to stretch out its legs. You may find yourself picking over things that have fallen because your Great Dane keeps on knocking them over with its tail. The Great Dane is statuesque and is considered as a luxury dog breed. Indeed, this dog never fails to inspire awe from anyone who is fortunate enough to see one! Illustrations depicting dogs that look similar to the Great Dane already appeared as early as 3000 B.C. These figures were found in various locations, such as in Egypt and Greece. During ancient times, these dogs were known as boarhounds and were the favored companions of hunters because of their size, agility, and strength. The Great Dane has been popularly known as a house companion, but you would be surprised to find out that it was originally bred to be a hunting and working dog. Despite the word “Dane” in its name, the Great Dane did not hail from Denmark. In fact, this dog breed largely proliferated in Germany and Austria and was called Englischer Hund. Its origins can be traced back to the cross-breeding of the English Mastiff and Irish Wolfhounds. They were regarded as luxury dogs and even shared sleeping quarters with their owners who were nobles and royalty.